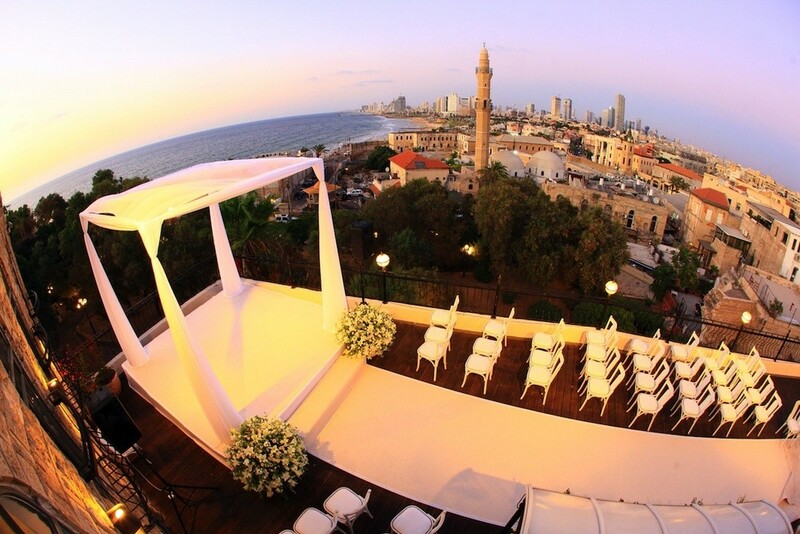 A rooftop chuppah (Jewish wedding canopy) with the Israeli city of Jaffa in the background. With interfaith marriages on the rise in America, Jewish seniors are adapting to new realities. Credit: Oren & Assi Eitan. One of the most significant trends within the American Jewish community over the past few decades has been the continued rise of intermarriage. For many Jewish seniors who were raised during a time of strong anti-intermarriage messages from the Jewish community, the growth of intermarriage presents a direct challenge to the values they were taught. New programming from synagogues, Jewish federations, and nonprofits seeks to help Jewish seniors adapt to these new realities while still maintaining the values they wish to pass along. “People who are becoming grandparents now grew up at a time when they heard a strong anti-intermarriage message coming from most Jews and the Jewish community,” Ed Case, CEO of Interfaith Family—a Boston-based national interfaith organization that provides information and assistance to interfaith families—told JNS.org. According to the Pew Research Center’s “A Portrait of Jewish Americans” survey that was released in October 2013, a clear majority of Jews—58 percent—marry outside the faith. This is up from 46 percent in 1990 and 17 percent before 1970, when many of today’s Jewish seniors came of age. At the same time, much like the American population as a whole, the proportion of seniors in the Jewish community is growing—nearly a quarter of Jews are now 65 or older. This creates a new demand for programming that will help Jews seniors handle their increasingly diverse world. A new program seeking to reconcile the ongoing Jewish demographic changes is GIFTS: Grandparents Sharing Gratitude, Inspiration, Family Tzedakah and Service, a curriculum put together by Interfaith Family and the Jewish United Fund/Jewish Federation of Metropolitan Chicago with a grant from the Covenant Foundation, which helps grandparents share their values and personal legacy with their grandchildren. Rabbi Ari Moffic, a rabbi based in the Chicago area who works with Interfaith Family, has helped develop and teaches the GIFTS curriculum at several local synagogues. “A component of [the class] is specifically geared towards how grandparents can share their traditions and pass on their values when their grandchildren are being raised in interfaith families,” Moffic told JNS.org. Moffic explained that there are several varieties of interfaith families she has come across. “Sometimes interfaith children have chosen another religion entirely, and that can be even harder,” Moffic added. In many cases, grandparents are looking for a forum to either gain tips about how to deal with their interfaith families and connect with their grandchildren, or just vent their frustrations. “We try to break that feeling down for them [during the class] and explore where it comes from. … Is it because they just feel it is a rich and wonderful way of life? Or is it because of social peer pressure from their friends, who go to their grandkids bar/bat mitzvah, and they feel isolation and pain because they aren’t having those experiences?” she said. Sharon Morton, a retired Jewish educator at Am Shalom Synagogue in Glencoe, Ill., is the founder of Grandparents for Social Action, an organization dedicated to helping Jewish grandparents and seniors who are seeking to share their roots in social action with their grandchildren. Morton is also working with Moffic and the Chicago Jewish federation in developing and teaching the GIFTS curriculum to Jewish seniors. She told JNS.org that one of the reasons she started the organization to help other Jewish seniors was her own experience dealing with her daughter’s marriage to a Christian man, and the couple’s decision to raise her grandchildren in a Christian home. “When my grandchildren were young, I taught them about Jewish values like philanthropy, tikkun olam (repairing the world), and being a mensch,” Morton said. “They all thought being a philanthropist was a law at 7 years old,” she joked. Morton said she now travels around the country helping other Jewish seniors communicate the values they think are important. In many cases, Morton explained, the parents’ or grandparents’ process for handling an interfaith marriage of children or grandchildren is similar to the process for grieving. “I talk to other people about that all the time. I tell them it is a process; there is a time for grieving, denial, and then finally acceptance. … This is the process I went through with my daughter,” she said, explaining that today she shares a strong relationship with her daughter based on mutual respect for Judaism and Christianity.